My life usually revolves around my phone. Being a blogger who works on the go, you’ll rarely find me sitting still. I’m either endlessly making calls, sending or receiving money and obviously being online doing research on various topics. For seamless running of these and more activities I grab onto any app that will make my life easier and one such app that has been of great help is mySafaricom app for a very simple reason; it makes doing everything else much more efficient! Most of our lives these days have M-PESA involved; whether its in sending or receiving money and we can all admit we have, at one point or the other had the fear of sending cash to the wrong person. Usually, we’re either in a hurry or we’re confident we have the number of the person receiving the money correct. But why risk it? Why risk sending that cash to a number you’re not sure of? Even though there’s the reverse option, some unfair people are known to withdraw before you can even have a moment to do this. MySafaricom app has the hakikisha functionality clearly incorporated and you can see the receiver’s name boldly before clicking send. Have you also ever been in a position where you want to pay your bills or buy stuff at a supermarket and even though you’ve typed the number correctly or said the number out loud like five times, you still want to be sure of the number you’re paying to? All that worry is washed away when you have the mySafaricom app on your phone. The moment you key in the PayBill number and amount and proceed to confirm, the app shows you the name of the business or service provider. Still on M-PESA, you can easily get your M-PESA statement on the app instead of having to wait for them to send it to you every month. Quite a way to manage your money. When it comes to airtime, you can get to view your airtime balance in much more detail all in one click. From data, credit to minutes and number of SMSs left, it’s so much easier than using the USSD code. Remember Nakumatt’s all under one roof slogan? Yeah, that’s basically how the mySafaricom app is. You can get access to services like Bonga, Sambaza, Skiza, Data & SMS plans all in one place. Instead of going back and forth with *126# for Bonga and *140# for Sambaza and the rest, you can easily and efficiently get all you want in one place freeing you from the headache of trying to remember all those USSD codes. Another thing I also really find efficient with the app is the Cost Calculator. I actually think it’s my best feature yet! Instead of going online to search how much it will take you to send or withdraw money from M-PESA, you just go to the Cost Calculator and enter the amount of cash you’d wish to send and withdraw and it brings you all the details you need. From how much it will cost to send to a registered or unregistered user, to how much it will cost to withdraw at the agent to how much it will cost you in total (Amount + Withdrawal charge). It also does the same for Lipa na M-PESA numbers. It shows you how much for example KPLC or Nairobi Water would charge for you to pay your bill before you pay it. The mySafaricom app has tonnes of other efficient uses including how to check your mobile consumption by apps and I use this quite a bit since as mentioned earlier, I work on the go quite a bit. Here, you go to the left corner of the app from the home page and choose the NetPerform option, then choose the Network option. 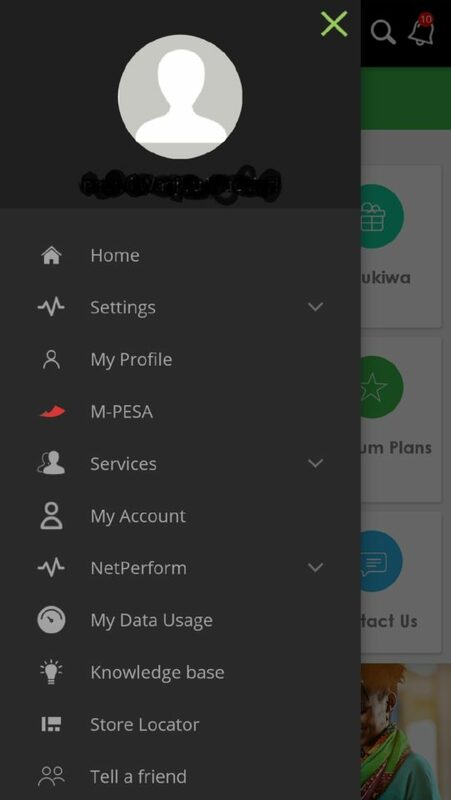 If you think your phone is churning up too much data or if you just want to be sure of where your bundles are going, this option on the mySafaricom app gives a detailed view of your usage of mobile internet and even calls – it gives you upto 30 days worth of data of the outgoing calls you made. 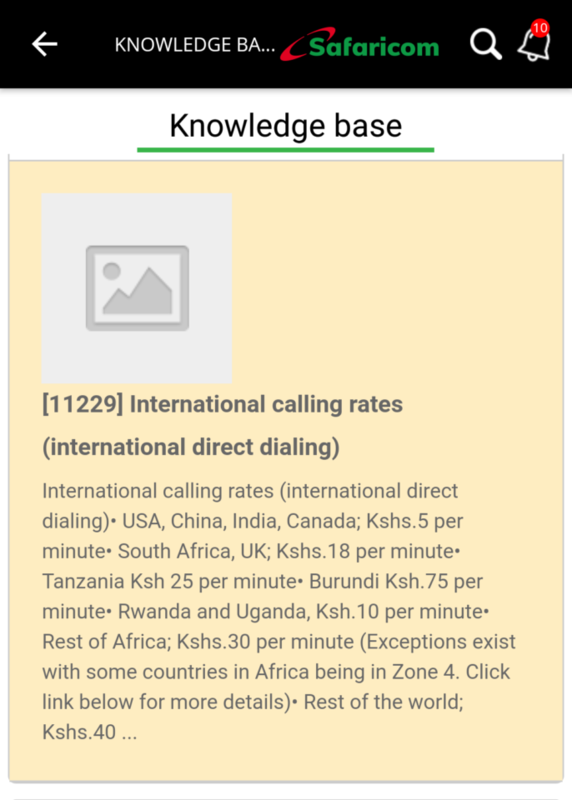 One very educative self care feature in the app is the knowledge base tab on the menu which has a wealth of articles on just about everything you’d like to know about your Safaricom line. It has a very rich Q&A with answers on everything ranging from roaming charges, calling charges for different countries, m-shwari, and Bonga Points. The Knowledge Base menu also has a search bar where you can type in your questions and the relevant articles will come up. This is one place I believe every user should spend some time reading and getting to know the in-depth working of their Safaricom Services. It is on the drop down menu on the left hand corner of the app. To get the app, download it from the Google Playstore or the Appstore for iOSand follow the simple prompts to start using.